It’s in their nature. Your cat needs to stalk, chase, and pounce. When cats live indoors without the stimulation of the outdoor hunt, it’s important to enrich their environment with species-appropriate play. If you don’t provide healthy outlets for their predatory instincts, your cat might have to engage with them in other ways – like climbing curtains, attacking houseplants, and chasing feet. In addition to discouraging bad behavior, regular helps keeps your cat stimulated throughout life, helping to prevent cognitive and physical decay as they age. Whether homemade, store-bought, or provided by nature, good toys do the same thing – they tap into your cat’s natural instincts to stalk, chase, leap, and capture. 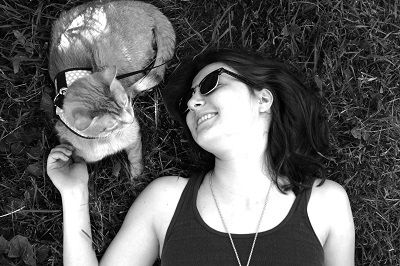 Interactive Cat Toys: These are toys that require human involvement. Fishing pole toys and laser pointers fall into this category. 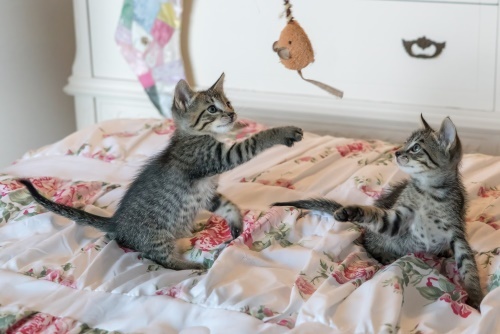 Cat Toys for Independent Play: Old-fashioned mice and electronic gadgets, along with most other products on the market fall into this category. 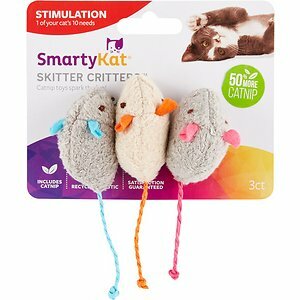 While they can’t move with the kind of intelligence that interactive toys do, these can be highly entertaining and keep your cat busy. 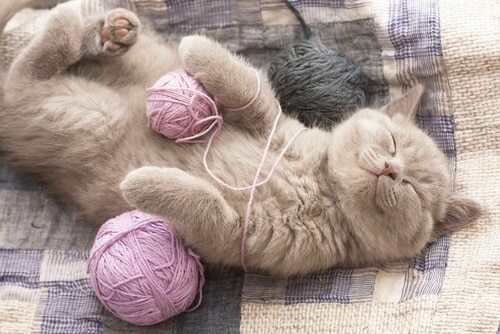 Soft Toys: These toys are like small dolls for your cat. Often stuffed with catnip, these toys feel a bit like a small animal, making them fun to kick, bite, and bat around. Battables: Springs, balls, and some mouse toys fall into this category. They’re a good choice for cats who bat around stray bottle caps and paper clips. Feeder Toys: For cats who eat too quickly or too much, these toys make mealtime an adventurous challenge. For cats, playing with toys is fundamentally a predatory game – it mimics the predator-prey chase in almost every way. Choosing an interactive toy taps into this hunting instinct. By putting yourself on the other end of the toy, you create a responsive experience. You can make the toy run from your cat, hide behind furniture, leap away, and eventually, you can allow the toy to tire out, succumb to capture, and stop moving. In the following video, celebrity cat behaviorist Jackson Galaxy talks about the importance of playtime and how to use interactive cat toys to provide a great play experience for your cat. It swirls, twirls, slithers, and wiggles! 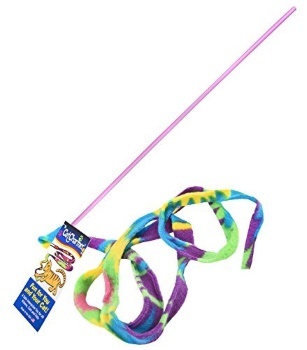 The Cat Dancer Cat Charmer toy is a fishing pole toy with a 4’ strip of soft, colorful fleece that moves in a way cats can’t resist. 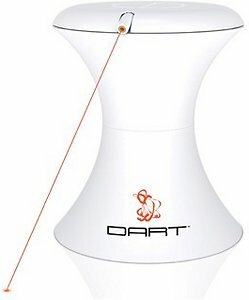 This fishing pole toy features high-quality construction for hours of interactive play. The handle is made from unbreakable polycarbonate material. What’s not great about the Cat Charmer? A few reviewers said that their cat ate part of the soft fleece ribbon, so if your cat is a vicious biter, you may want to keep the toy in hiding when you’re not playing with your cat. And several customer reviews say that this toy is too good – it overstimulated their cats and made them aggressive. Instead of leaving your cat home alone to make their own entertainment, provide a healthy outlet for all of that predatory energy. Remember that without human interaction, your cat’s toys are essentially dead prey, requiring a flick of the paw to start running. If your cat is highly energetic and loves batting toys around, standard toys like mice, balls, and springs may keep your cat entertained. Other cats, however, want something more life-like. In this case, electronic cat toys work better for independent cats in the house alone. We’ll discuss those in the next section. What would a cat’s toy box be without mouse toys? These catnip-infused mice have a reputation for firing up even the laziest cats. A surprising number of reviewers say that these toys sent their normally apathetic cat skidding around the house in hot pursuit of that chunky, furry mouse. These mice have soft, biteable bodies and slappable, chaseable tails made from twisted rope. The next best thing to a human-controlled toy, electronic cat toys can move erratically, charging up your cat’s appetite for the hunt. 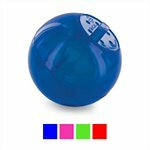 This battery-operated concealed motion toy is made to mystify. Underneath the sturdy, washable cover is an erratically rotating wand, which sends a fluffy feather dancing around the edges. It has four speed settings and unpredictable motion, so your cat won’t get bored. As your cat gets more excited about playtime, they’ll start jumping, lunging, and leaping – burning calories and strengthening their muscles. Therefore, the best cat toys for exercise are the ones that your cat is willing to chase after. Toy mice and other inactive toys can be fun, but they won’t make your cat jump. That’s why fishing pole toys and those that mimic the flight of a bird are a great choice. These engage all of your cat’s muscles and force them to move in ways that they wouldn’t otherwise. 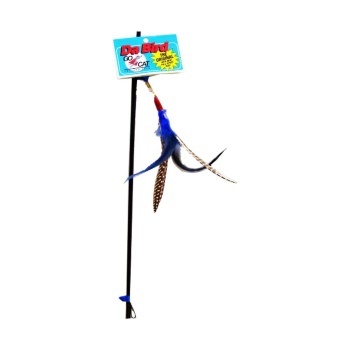 This is a high-flying fishing pole toy that mimics the look, feel, and sound of bird wings. The realistic bird swoops over your cat’s head and encourages them to jump for their colorful prey. Remember that Da Bird is breakable and your cat could accidentally ingest parts of it. One reviewer said that their cat accidentally swallowed the plastic cap holding the feathers together, necessitating surgery. Although it doesn’t score well in durability tests, Da Bird earns its place on this list as an extremely popular and well-loved product. Cats have been doing flips over this toy since the 1980’s. The elusive red dot sends cats up walls and skidding across the floor – but it’s not the perfect cat toy. What makes laser pointers so exciting also makes them frustrating – they’re impossible to catch. Cats crave the satisfaction of catching their prey. When your cat finally slams their paws down on that little red bug, they want to feel something they can potentially sink their teeth into. They don’t want it to slip straight through their paws and off again across the room. After several unsatisfying play sessions, the laser pointer loses its value. Discouraged by the fact that they’ll never capture the elusive dot, your cat will have to move on to something with satisfaction potential. This advanced laser pointer will allow you to go next-level with your laser game. In manual mode, this is an ordinary laser pointer for interactive play with your cat. But when you’re not available to share the fun with your cat, the FroliCat Bolt works on its own to direct an unpredictable beam across the floor and walls. It automatically stops after 15 minutes, ensuring that your cat doesn’t become overstimulated or bored. If your cat would rather lounge than chase after a toy, your mission is to find an absolutely thrilling toy that even the most slothful cat can’t resist. Feeder toys help to modulate the amount of food your cat eats by making them work for their meals. It also may be psychologically beneficial for cats to play before their meals. This study demonstrated that cats are more playful when they’re hungry – just another indicator of the profound connection between playing and preying. 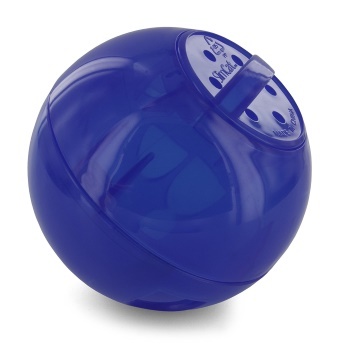 This toy contains kibble or treats and releases them only after your cat sends the ball bouncing and shaking across the room. Because it creates a connection between hunting and eating, it makes every meal a little bit more satisfying. Unfortunately, this feeder doesn’t work with canned food. Cats love the stimulation and exercise of play and they also appreciate the ability to stretch out and remove their claw sheaths. That’s why toys that incorporate a claw scratcher are so fun and satisfying. 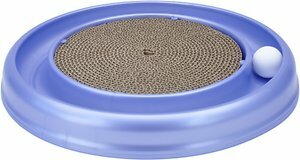 These are particularly useful for cats with behavioral issues. 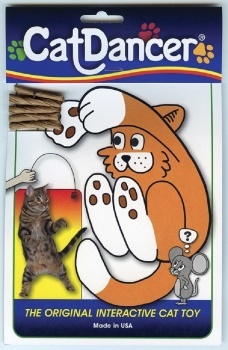 They allow you to solve two problems at once by providing a toy that targets your cat’s need to scratch and their desire to play at the same time. Remember that even if you give your cat a scratcher toy, it’s still a good idea to provide an additional scratching post. 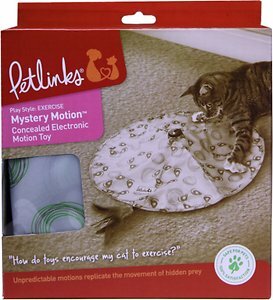 If your energetic kitten or cat has been scratching up the furniture and skittering around the house, give their energy a productive outlet with this toy. The ball track is built around a cardboard scratcher center, giving your cat a way to satisfy their natural instincts for both play and scratching. If your cat is one of the 50% of cats who is responsive to catnip, they might enjoy catnip toys. Most cats become excited and frisky when affected by this herb, making playtime all the more fun. But some catnip toys simply don’t work. They’re made with stale or low-quality catnip and lack a cat-friendly design. The best catnip toys are made with fresh, potent catnip that will drive your cat wild. 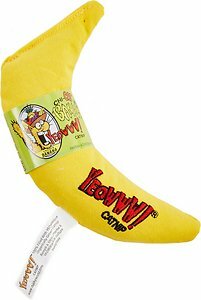 This banana-shaped toy is one of the biggest stars in the cat toy world. Catnip-sensitive cats can’t resist bunny kicking, batting, rubbing, and licking this sturdy cotton twill banana. Each hand-stuffed banana is packed with extremely potent organic catnip leaves and flower tops and includes none of the low-value stalks and stems found in lower-quality catnip products. To keep your cat safe, the banana is dyed with only natural vegetable or soy-based dyes. Mornings and evenings are the best time of day for play sessions: This is when cats are naturally most active. Playing with your cat before you leave the house in the morning will increase your bond and help them to feel calm during the day. A play session before bed is a good replacement for those sleep-breaking midnight crazies. Give your cat the satisfaction of a successful hunt: Provide a meaty treat after each play session. Never allow your cat to play with your hands. Kittens often don’t know to avoid scratching and biting your hands during play. If you don’t train them to avoid this behavior, it could become more destructive as they age. If your cat does hurt you during playtime, immediately stop playing to show your cat that the fun ends when they let their claws and jaws get out of control.